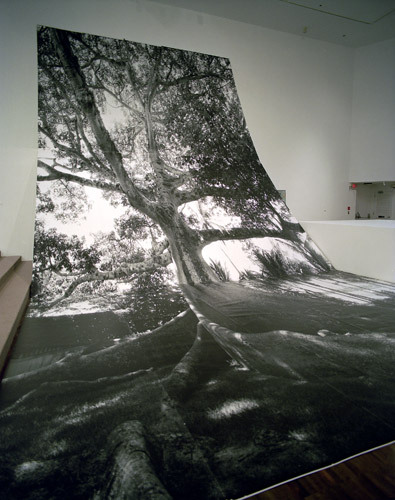 Solo Exhibition / Museum of Contemporary Art, Lake Worth, FL /1998-99. 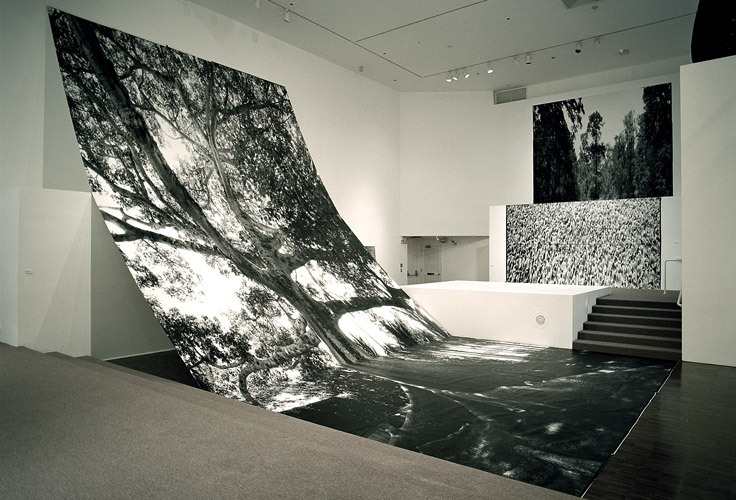 Left image: Forground - Gradient (Biscayne Giant), b&w photograph, wood, 21 ft. h x 20 ft. w x 32 ft. d, length of photo, 42 ft.
Gradient (Biscayne Giant) along with Carbonate Falls (Marsh Lettuce) use scale, image, digital alteration, configuration and symbol to evoke the extensive geo-hydrologic systems of south Florida. The almost flat terrain of soutn Florida is permeated with dynamic/complex aquifer systems that feed on the terrestrial climate, oceanic hydro-influx and exhange, and flow from the northern part of the state. The arboreal and marsh structures imaged in these works (hydrologic systems in their own right), were selected and transformed as representatives of this hidden dynamic. The images were digitally stretched and configured as cascading elements responding to the architecture of the installation space.